Please refer to our stock # 1798/6221 when inquiring. 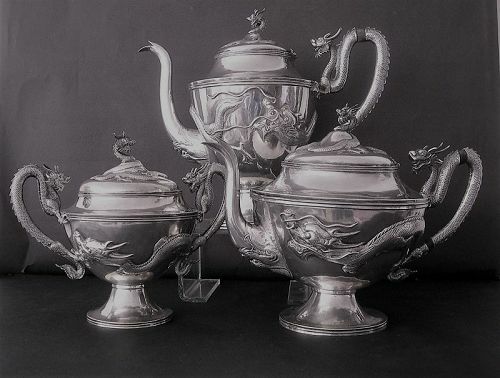 A Chinese three piece tea and coffee set decorated with a raised dragon stretching right around the bulbous body of each item. This decoration is laid on the flat surface and forms a three dimensional sculptural effect. The handles are formed as sea dragons and the finials as heads of the creature. The craftsmanship is breathtakingly detailed and fine , the weight is a good gauage of 1800 grms (58oz.). It is stamped MH 90 and Chinese characters. Age: 19C. Please note that the heat separators of the handles are of WOOD and not ivory and therefore the sale and Export of the set would not be subject to CITES regulations. Condition: very good indeed, no splits, no restoration.